Walking into The Yard is like walking into your home away from home. In the Thai language, “Yard” means family and I can honestly say that never before have I felt so welcome in a hostel. The hostel opened in early 2015 and already feels like home. The dynamic duo of Big Som and Little Som, have created a truly magnificent space where the people, the atmosphere and the concept have all come together in perfect harmony. Upon arriving at The Yard, guests are not only greeted by a smile from one of the two Som’s, but also an immediate sense of relaxation. The garden is a secluded paradise, away from hustle and bustle of Bangkok, and yet close enough to still enjoy all that this city has to offer. The Yard is an easy 5 minute walk to the nearest BTS Skyway station, Ari, and it takes roughly 10 minutes on the BTS to be in the middle of Bangkok’s main shopping districts. The fabulous and must-see Chatuchak weekly market is also easily reached via the BTS. The hostel is built entirely from shipping containers and all common areas and balconies look out over the communal garden where the rooms literally open onto nature. The entire hostel has been created with every minute detail carefully thought out and executed to perfection. The décor is a little bit vintage, a little bit hipster and wonderfully unique while always keeping the environment and nature in mind. There are three different room types available at The Yard housing up to 44 guests at a time. All rooms have access to shared bathroom facilities that are modern, clean and have all the facilities of a hotel, down to shampoo, shower gel and a hairdryer… yes ladies, a hairdryer! 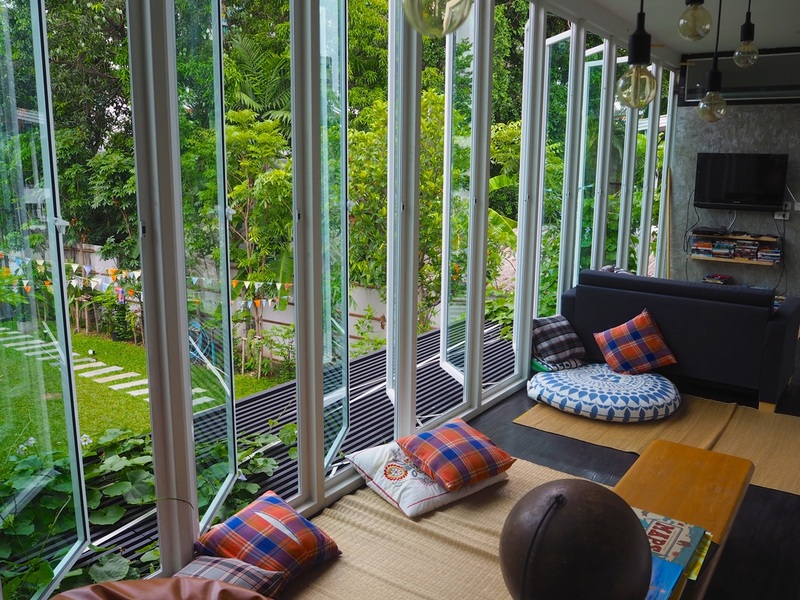 Every room is air-conditioned however they generally stay quite comfortable due to the innovative insulation put into the containers to keep the cool air in and the humidity of Bangkok out. 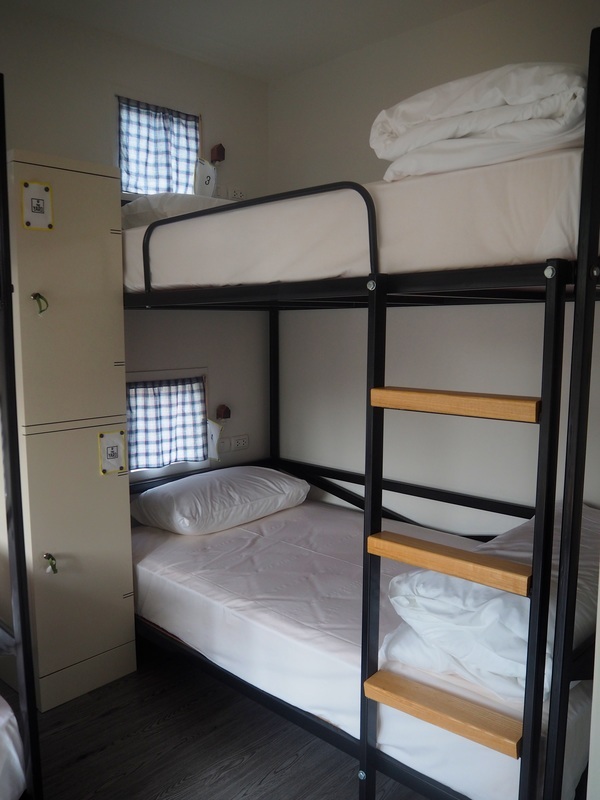 Each bed in the dormitories has it’s own private locker, power point, reading light and even a small window for each person so that you can enjoy the garden views before you have even stepped out of bed for the day! The communal “Family Room” is a charming space with awesome views over the garden and has everything you would want from your own little piece of home. There are books, DVD’s, games and plenty of space to just chill in a beanbag or relax on the couch. The adjoining kitchen has a fridge and microwave as well as purified hot and cold water that you can use to fill your recyclable, glass drinking bottle that is provided during your stay to reduce the waste created from plastic containers. After a long day of sight seeing around Bangkok, being able to sit on the grass and relax back at The Yard is exactly what many travellers need. There is also an onsite bar, a small food menu and a light breakfast provided every morning. We honestly cannot recommend this place enough. 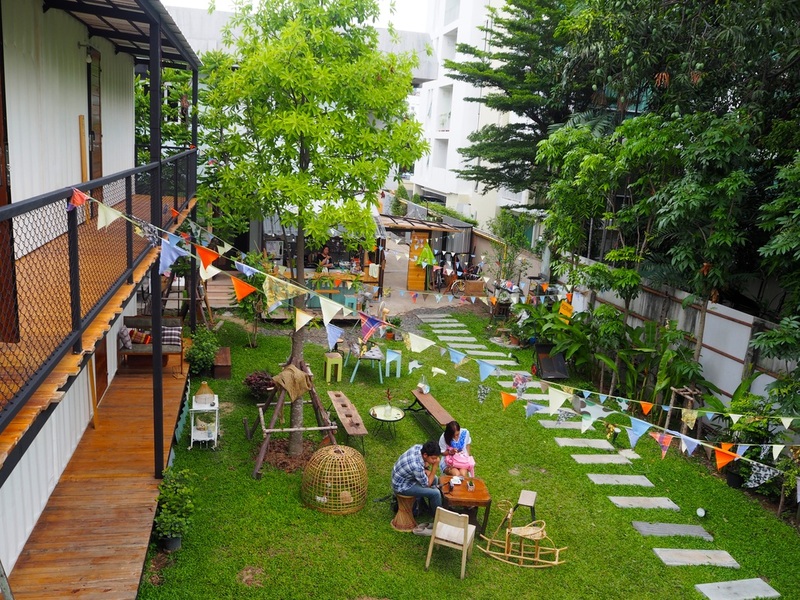 If The Yard is the new standard of modern hostels, then the bar has been set VERY high! We were impressed from the minute we arrived to the minute we begrudgingly left! 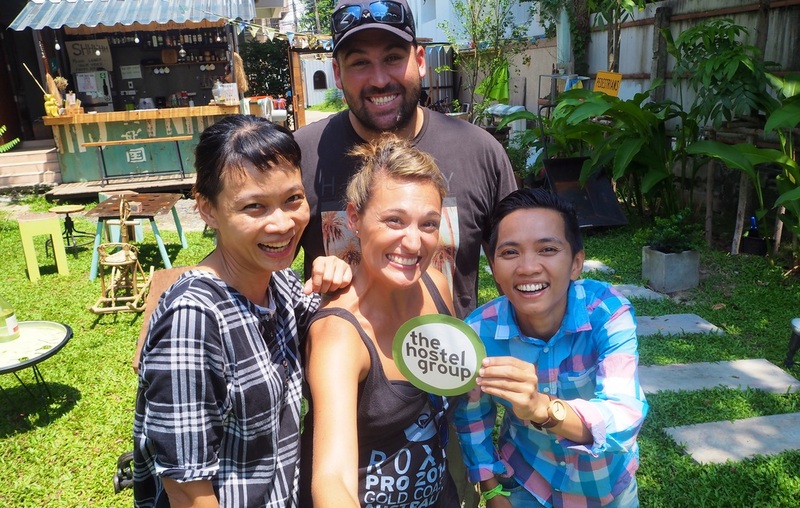 We can only hope to return here one day soon, not only to stay at this fantastic hostel, but also to catch up with the wonderful new friends made during our stay.